For craft beer lovers, visiting every brewery in your home city is a New Year’s worthy goal. But like most January-announced missions, it’s one I continued to set and fail. As an outdoor athlete known for backpacking urban routes, I thought my best shot to achieve that dream would be if I did it all at once, on foot. So in March 2017, I hiked 100 miles over eight-days to all of Denver’s 65 breweries. Denver’s population is growing and demographics are changing. Sometimes it’s hard to build community against a backdrop of ever-present construction. As a backpacker, to understand a landscape, I have to see it by foot. Perhaps at a slow enough speed, I could process these urban changes, too. Though I lived in Denver, I had only frequented a few of its many neighborhoods. The Denver Brew Hike would force me into the far reaches of the city and into neighborhoods quite unlike my own. 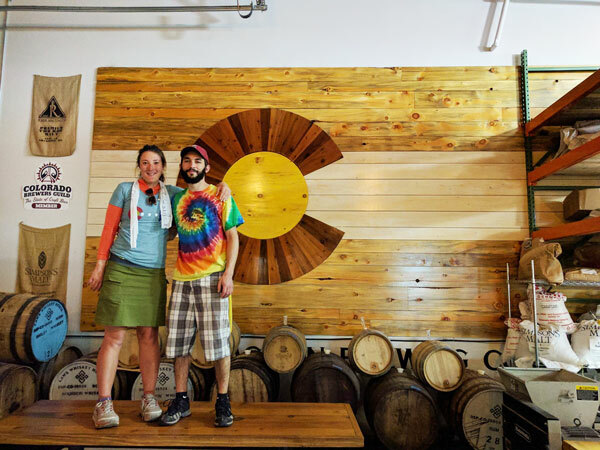 With breweries anchoring the hike and footsteps connecting them, I could appreciate the flavor of Denver’s different districts. In breweries, I could pause, reflect, and meet people on their own turf. Walking and beer could tie together my questions about a changing city. Liz learned to use an umbrella to block out the sun when hiking through deserts. 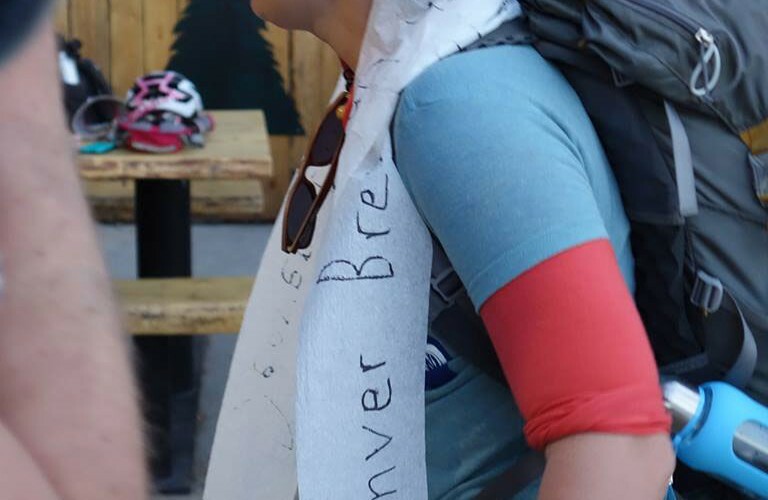 As a professional hiker, the Denver Brew Hike was my eighth urban backpacking trip–but my first with a beer theme. Most pub crawlers don’t have to worry about logistics. But details consumed me. “Are Creede, Bruz, and that new River North facility in Denver City Limits?” (No, but I went there anyway). “Can I walk from Goldspot to Chain Reaction while still catching De Steeg on the one day it’s open for more than four hours?” (Yes, but I have to hustle). When mapping a route, I always rely on the local community for those kind of details. Urban hiking has shaped friendships in unlikely places. It’s immersed me in niche networks in cities across the country. But would the Denver beer scene take me in, too? Why the hesitation? For one thing, I don’t have the face most people imagine when they think “drinking a cold one.” As an Asian American woman, I’m an unlikely champion for beer. It’s one thing for me to relish craft beer at home–it’s another to put myself out there, open to the scrutiny of the beer community. But even before I downed my first pint, a shared love of beer forged connections. While I was still in the planning phase, Colorado Beer Geek suggested which breweries to include (and what to drink where). My friend Nikki Minette, a veteran taproom manager at several breweries, connected me with beer writer Jonathan Shikes. I fangirled when Miss Lupulin, a rare female Advanced Cicerone, met me at Wit’s End. My hiking partner, Naomi Hudetz, and other friends from the hiking world wanted to join too. To my surprise, beer lovers everywhere were eager to be allies in my quest. Then I got an email from Kyle Clark, host of 9News, who sent his cameraman, Chris to join us on the journey. Now, the Denver Brew Hike was more than a mapping experiment: Denver would be watching. It’s easy nowadays to hide behind our cars and gated neighborhoods. But we form real community by gathering and interacting with those unlike ourselves. Walking to a brewery forces us to encounter strangers along the way. It lets us observe everyday surprises: a flower opening, a cat in the window, or a Little Free Library. Being in a brewery further opens us to new ideas from new people. We build a better world when we put ourselves out to others. Nowhere were people putting themselves out to the world quite like at Factotum Brewing. I hiked into this Sunnyside neighborhood brewery on a hot Saturday. A beaming man greeted me: “You’ve got to try my beer!” He pointed proudly to what appeared to be a sports bracket. Factotum’s co-owner Laura Bruns explained. This brewery is a space for homebrewers to practice on professional equipment. Here, they can share their experiments with the public, get feedback, and learn next-level beer-making. There was currently a March Madness-style beer competition going on. My new friend here was hoping to advance to the finals. While this gentleman talked hops, I looked around. It was clear Factotum was a second home to him and the other homebrewers taking a stab at the big leagues. Although they weren’t making beer right now, they still wanted to be there, to share, and to hear about our hike. Sure, a couple of drinks can take away the fear of meeting new people. But space and place matter too. Over eight days, I started thinking of breweries as this giant Petri dish of human collaboration. Factotum is an incubator where creativity could flourish: people taking their best liquid art and displaying it to the world like a tap-filled gallery. Breweries were a place of hope, growth, and excitement. Factotum’s palpable vitality energized my (by that point) hike-worn body. Sociologist and community-builder Ray Oldenburg described a “third place” as neither home nor work, but somewhere that still feels like your own. In 18th century Paris, this was the coffee shop. Thinkers and revolutionaries met there on neutral turf for spicy political debate and philosophical discussions. In those days, coffee was the drink du jour, a hip new import from recently colonized lands. But now, amidst the craft beer revolution, the third place is the neighborhood brewery. It’s our era’s place to relax, to learn, to have our mind expanded through conversation. The modern third place works like the old: introducing us to new people and new ideas. Platt Park is like many craft breweries in Denver: that neighborhood third place. It’s in a cute row of shops across the street from the ice cream parlor and next to the folklore center. It’s not designed to be showy, like the bigger downtown operations that cater to tourists. Across Denver, people go to their local brewery to play trivia or learn yoga away from judging eyes. Breweries are places to sing karaoke or practice stand-up. Platt Park feels like a place for regulars, where everybody knows your name … but the beer is better. In a brewery like Platt Park, beer is the common conversation topic. It’s like sports or the weather; something safe to connect dissimilar people. When I talked with strangers about the breweries I had visited, it was like we were gossiping about mutual friends. We could discuss any one’s quirks, stellar stand-outs, or much-missed seasonals. And the thing is–we both cared, deeply, about what this friend was up to. The local brewery meets another requirement for third places, too. It’s a great leveler. In a brewery, I could forget I was walking around town with hiking poles and a mountaineering backpack. I met people I may never have talked to in any other avenue of my life. But here in the safety of this brewery, we could be one with our differences, united by our common love of beer. By the time we reached Brewability Lab, it had been 10 miles since our last brewery and too many hours since my last beer. The nearby industrial district’s streets lacked shade trees or sidewalks. Trucks sped by. Inmates at the county jail catcalled us. “Why did I even include this brewery on the map?” I grumbled to my hiking partners, who must’ve felt duped into joining me that day. But I was about to discover the most memorable brewery of the entire Denver Brew Hike. At Brewability Lab, young adults with special needs serve beer in chemistry beakers. They crack jokes with you from across the bar. The Lab provides much-needed jobs and training for those with developmental disabilities. It is also a space for visitors to get to know them on their own terms. Founder Tiffany Fixter sees beer as a medium for civic activism. As a former special needs teacher, Tiffany wasn’t seeing a lot of meaningful opportunities for the people she served. Now, she’s creating the change she wanted to see. Tiffany greeted us and introduced us to our beertender, Tony, who is deaf. “Can I take you on a tour?” he asked. I hesitated. We were behind schedule and needed to get out of the dimly-lit industrial zone before dark. But Tony’s enthusiasm to show us around rivaled that of the homebrewer-turned-semi-finalist at Factotum. How could we say no? Walking to Brewability may have been a hassle. But it highlighted how breweries like this are on the margins of the city, like its employees are on the margins of society. Hiking there gave me time to reflect. How could I be the change I wanted to see? What hassles are worth it to build a better community? When owners come from the place where the brewery sits and speak the language of its people, they reflect the vibrancy of a city like the murals that adorn its buildings. What makes the craft beer industry so much more than another product in a bottle is the people. To meet those people in their own zone and to get there by foot removes barriers and pretenses. It emphasizes our shared humanity. So I’m not stopping. 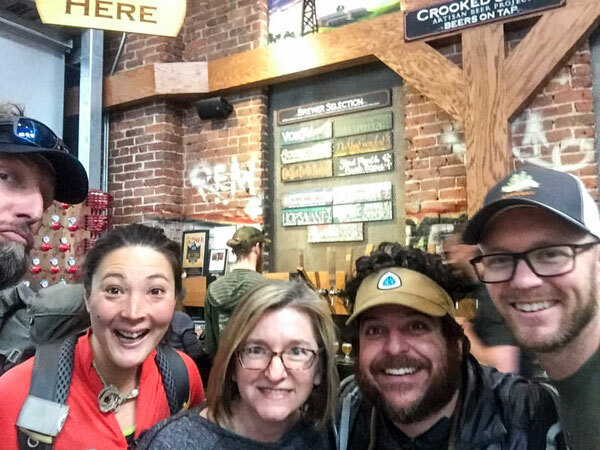 I repeated the brew hike mission in Bend, Oregon, in February 2018. And next month, with the support of Backpacker Magazine, Visit Grand Rapids, the Michigan Brewers Guild, and Merrell, a local outdoor company, I will brew hike Grand Rapids, Michigan. I’m thrilled that now tourism bureaus, local businesses, and even libraries are recognizing craft breweries for what they are: the new blood of cities. 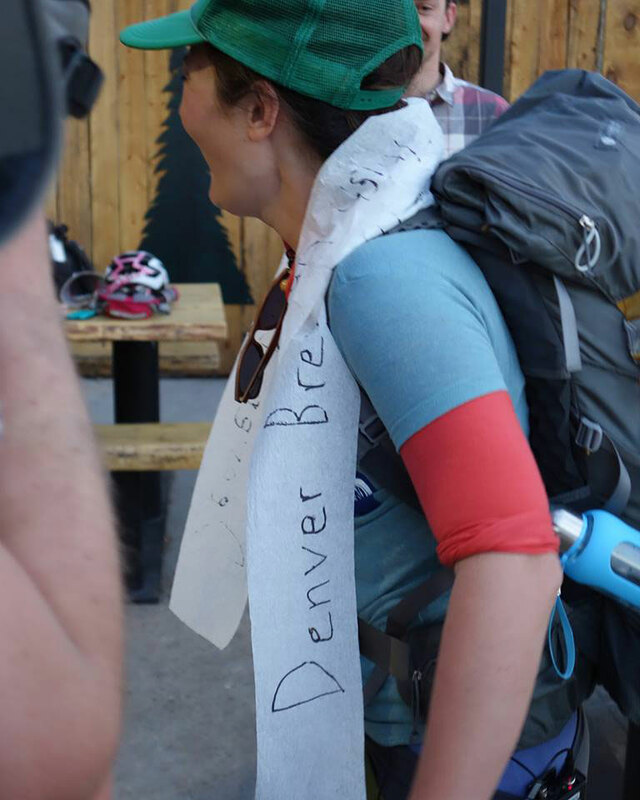 I want the people who watched the Denver Brew Hike on TV to remember it as more than a frivolous human-interest story. Connecting Denver’s breweries by foot changed the way I think about Denver and the role beer plays in it. Breweries don’t have to be like any other business. When owners come from the place where the brewery sits and speak the language of its people, they reflect the vibrancy of a city like the murals that adorn its buildings. Breweries can anchor communities, if we keep them focused on the local. 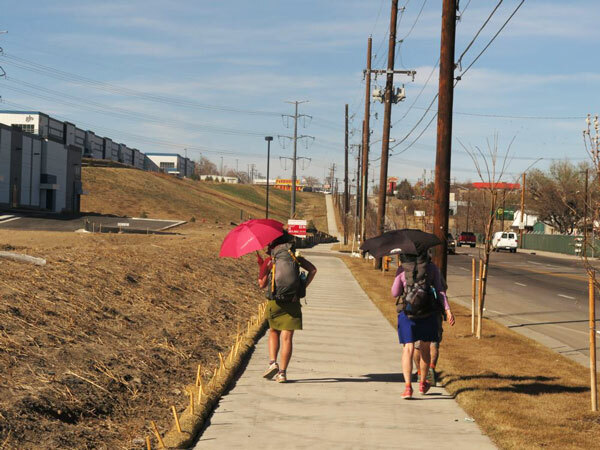 The post Finding Community on Foot: My 100-mile Denver Brew Hike appeared first on CraftBeer.com.